Solo is a bit buggy. There, now that we got that out of the way, Solo is a buggy, beautiful, thoughtful game which takes you on a simple, puzzle-solving adventure through an ever-appealing island where you are compassionately interviewed about your perspective on love. I was going to play this through with my husband, but I am glad I didn’t! It is such a personal journey (plus, I got to enter his name in as my significant other, which was cute and fun). Despite a few control issues, Solo is incredibly immersive, even with how minimal it comes across. It is great to see a game delve deep into how I feel about intimate, emotional topics. All too often, games have a message they try to get across — it is wonderful to have one actually collaborate with me to create that message, instead! 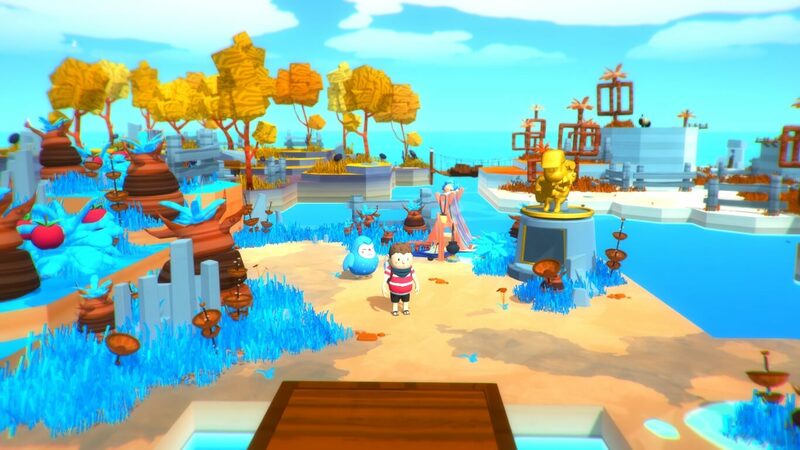 The basic premise is that Solo is a 3D, rotating camera platformer where you can move boxes around to create step-ups for your little character to get from level to level. The mechanic is easy, but the level design is done well, to the point where you do have to think a bit to make it all work. You can rotate the camera around the beautiful world in order to find all the boxes you need and figure out how to create stairs to get to the next area. Whenever you complete the puzzle in an area, a spirit of the island appears to ask you questions about love and your relationship. Every once in a while, Solo introduces a new item or game mechanic and instructs you in its use, so puzzles become more and more complex, although never to the point of being daunting. This is a self-care game if I ever played one! I suppose on paper, this sounds like a cheesy game — and perhaps it does somewhat match up to that, but it is a wonderful part of the experience. A neat little surprise for me was that you can choose your gender and the gender of your partner — and that the ‘in between’ option was present. This isn’t necessarily revolutionary (who am I kidding? Yes it is. You can even change your choice mid-game), but as a genderqueer gamer, it just made me feel a little bit more at home, which made the quest to discover my inner feelings about romance even easier to delve into. I know this sounds like a silly premise, and to be honest if I had read Solo’s plot online before playing, I probably wouldn’t have picked it up. But believe me, this is a great play experience. I almost didn’t include any of it in this review, because I know it can be a deterrent for some people, but this is totally a game you have to play if you love cute, thoughtful and well-written stories. The graphical and musical aesthetic they use feels comforting more than anything else It draws you in and welcomes you to its world, hoping you will stay but not really having any entitlements about it. Above all, my favorite thing about Solo is that it was well written. A lot of times, the writing in games goes by the wayside in favor of making use of team members’ other skills such as graphic design and coding. I am almost glad that there are a few problems with the camera control or the gameplay, because that just means a little bit more time and effort was put into the writing, the mood and the feel of Solo. When I started playing, I was faced with the option of starting down the game’s predetermined route, just hanging out, swimming into an endless ocean or playing guitar. These are the games I want to play the most — ones that are beautiful and imperfect, just like life. I am excited to continue to explore this island, as well as ideas about my own relationship, and let this little game encourage me the whole way. Solo is available on Steam right now! Go get it HERE!